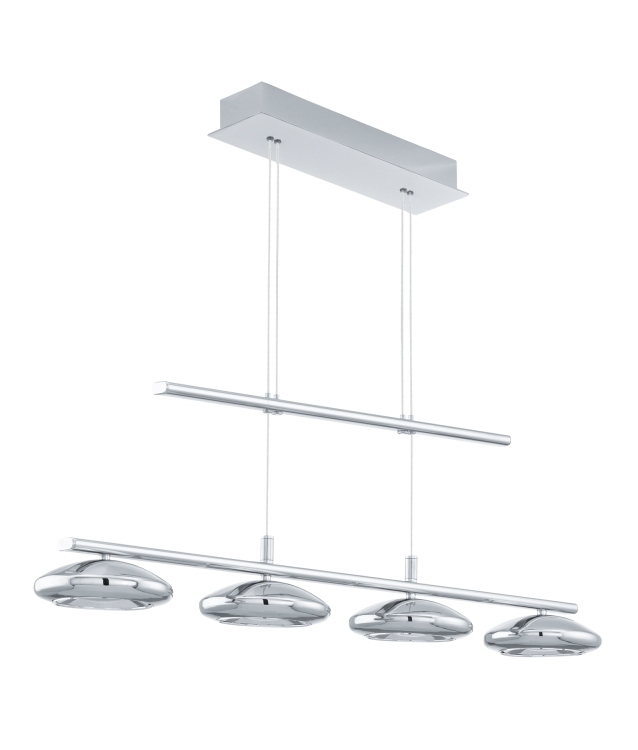 This polished chrome four light LED pendant is great for that much desired centre piece. Rise and fall fittings are great for installation above dining tables or breakfast bars with the flexibility to move the fittings while they are in situ. Simply pull on the draw bar and adjust the light intensity required to suit your task. 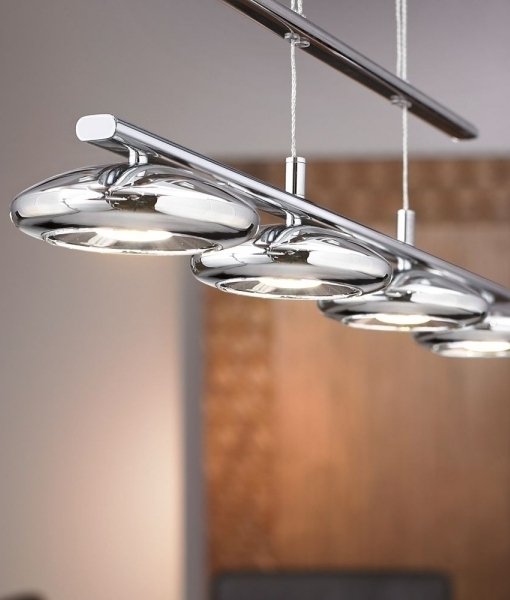 This 725mm wide pendant bar holds four semi circle chrome shells each housing an energy efficient LED lamp. 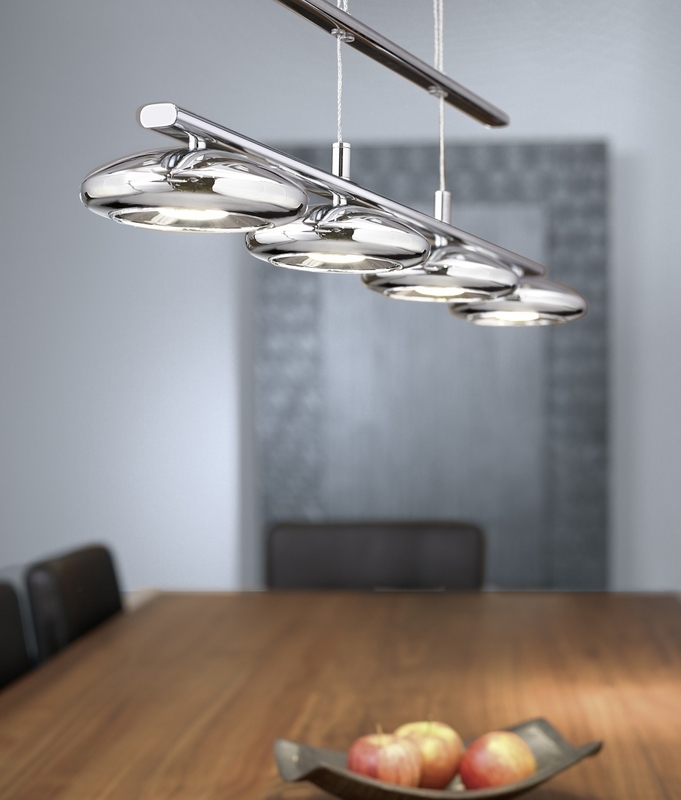 The pendant can be raised to a minimum drop of 640mm or lowered to a maximum drop of 1480mm. Comes complete with 4 x 5w LED lamps, giving a total of 1400 lumens of warm white light and a lamp life of 25,000 hours. Shade dimensions - Width: 125mm x Height is 55mm. Spacing between each shade fixing is 190mm. What is the specification of the bulbs used if I wanted to buy them in future and the supplier did not support this model in future? The LED chips used have Avery long life. Replacement can be undertaken by us using spares held in stock by the manufacturer. Can this light be used with a dimmer switch? Can you suggest any similar rise and fall lights which can be used with a dimmer switch? This particular fitting as inbuilt LEDs which are non-dimmable. Check out https://www.lightingstyles.co.uk/ceiling-lights/rise-and-fall-ceiling-lights for other rise and fall fittings. I would like to know if 'long life' means LED bulbs can or cannot be replaced? This particular fitting does have replaceable LED lamps which can be purchased from the supplier as a spare part.